Vietnam is seeking recognition as a market economy to benefit from the removal of trade and investment restrictions. During the visit of the US Trade Representative Ronald Kirk to Hanoi, Vietnamese President Truong Tan Sang noted that the two countries should bring relations to a new height and urge the US to boost investments in Vietnam. 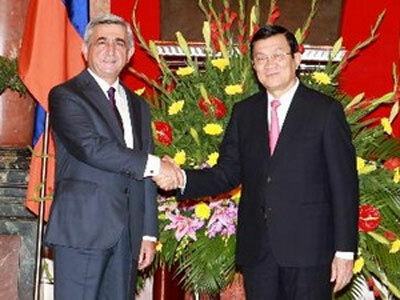 President Sang said Vietnam welcomed the new development in the bilateral ties with the United States. He stressed that the two countries should bring the relations to a new height on the basis of respect on independence, sovereignty and the territorial integrity of each nation for the interests of peace, stability and co-operation across the region. During the visit, Ronald Kirk met Vietnamese President, Deputy Prime Minister and other senior Vietnamese officials respectively, discussing the bilateral trade and investment relationship between the two countries. Issues related to the Trans-Pacific Partnership (TPP) were on the agenda. Kirk affirmed that the US government also wished to see stronger development in bilateral relations between Vietnam and the US. He emphasized that co-operations in economics and trade are the main factors in the Asia-Pacific policy of US President Barack Obama. He expressed his wish that the two countries, along with other parties, would complete negotiations on the TPP soon. TPP is a high-standard regional trade agreement currently under negotiation by the US, Vietnam and seven other Asia-Pacific nations, including Australia, Brunei, Chile, New Zealand, Peru, Singapore and Malaysia. It aims at further expanding the flow of goods, services and capital across borders. The next negotiating round of the TPP will take place at Leesburg, Virginia from September 6-15, 2012.